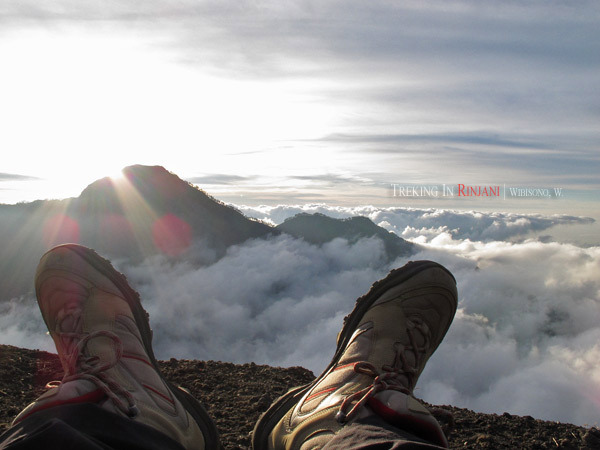 There are two common routes of trekking in Rinjani. 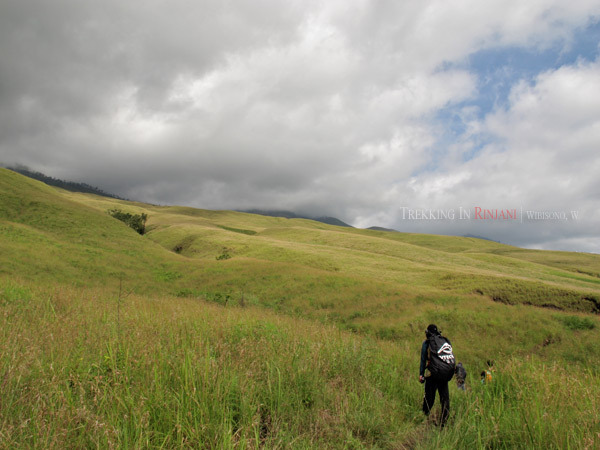 From many writings I had found in the internet, people departed from Senaru, climbing through tropical forest and ended in vast sloping savanna in Sembalun Lawang two days later. 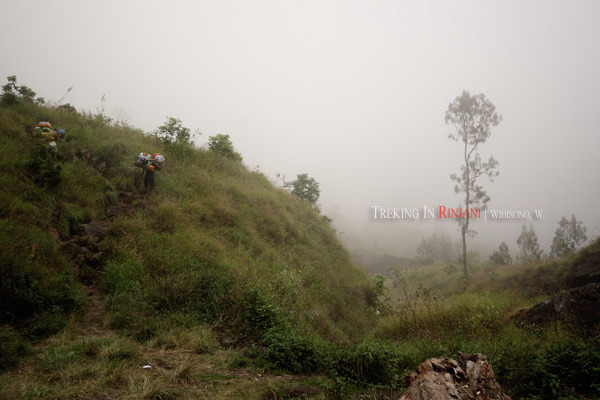 They reached the summit on the third day of trekking (most people took a - three day and two night - trekking). As for our trekking route, it was the other way around. 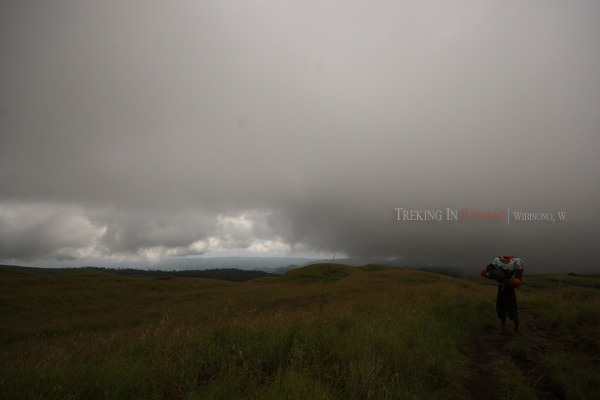 We were set to reach the summit on the second day of the trekking. 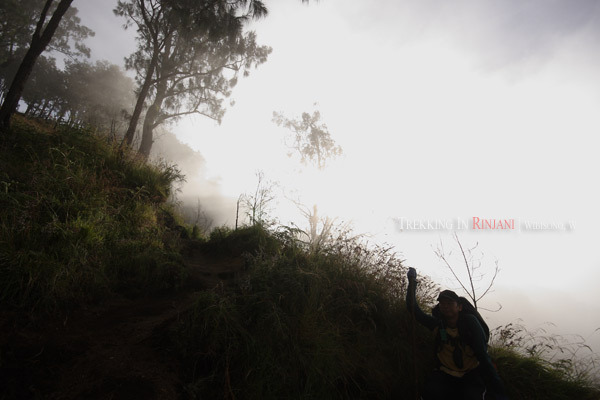 Since we stayed overnight at Senaru, we had to go first to the starting point at Sembalun Lawang. It took about an hour to reach the point by car. We started the second day with breakfast at Pondok Indah, the place we had stayed overnight. 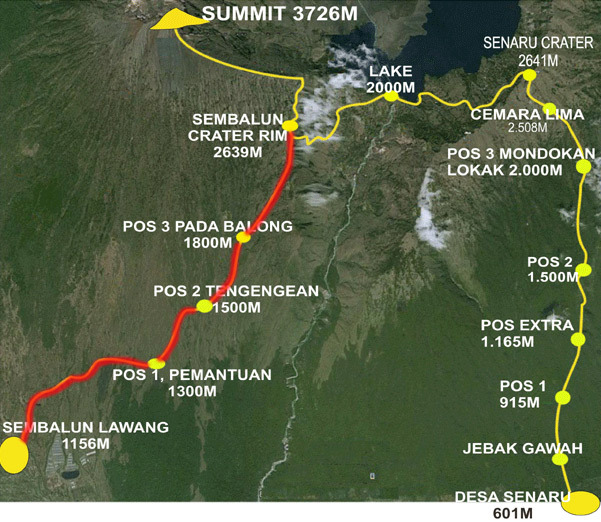 Our route is highlighted with red color. Map is taken from of Lombok Eco Tour. 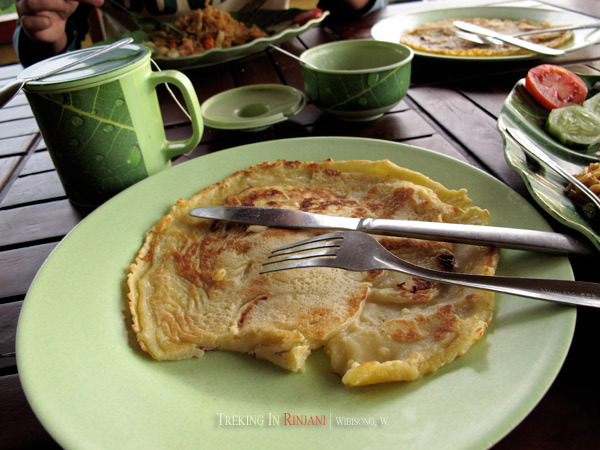 Pancake with sliced banana was a common breakfast for tourists in Lombok. Instead of serving it with syrup, they gave us white sugar with no butter. The fried noodle we ordered came with scrumbled egg and vegetables. Those two were our first breakfast in the island. 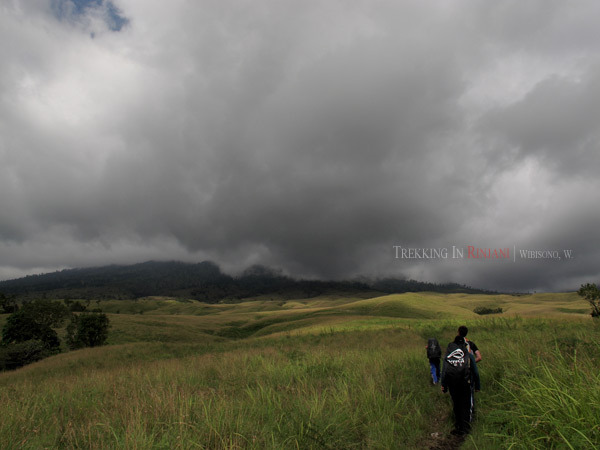 We were waiting to be picked up by the people from trekking organizer. 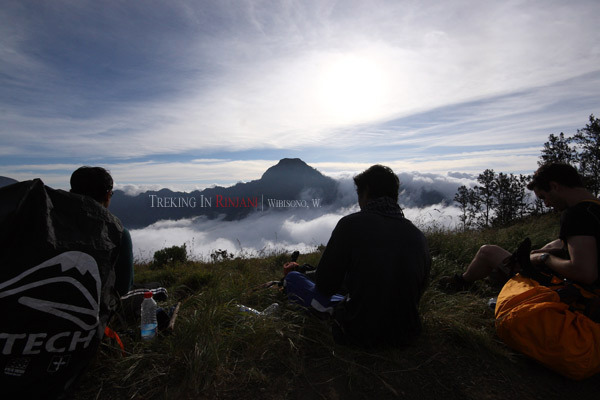 They were scheduled to come at seven thirty after picking up other trekkers from Senggigi. I was in the toilet when a mini truck loaded with stuffs came to Pondok Indah at around seven. 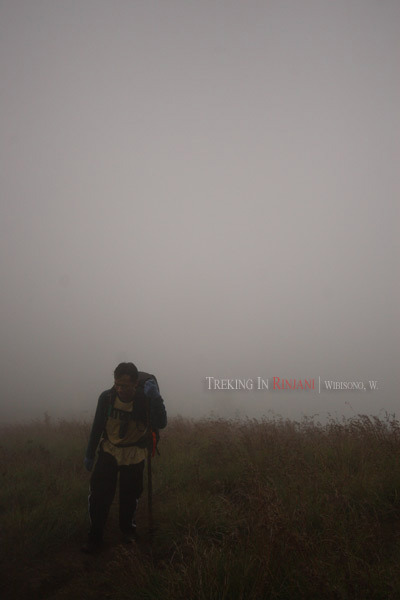 A friendly guy came to me and introduced himself as the trekking guide. His name was Syaiful. He came with three porters, a driver, and two foreign tourists who had been picked up from Senggigi at five in the morning. 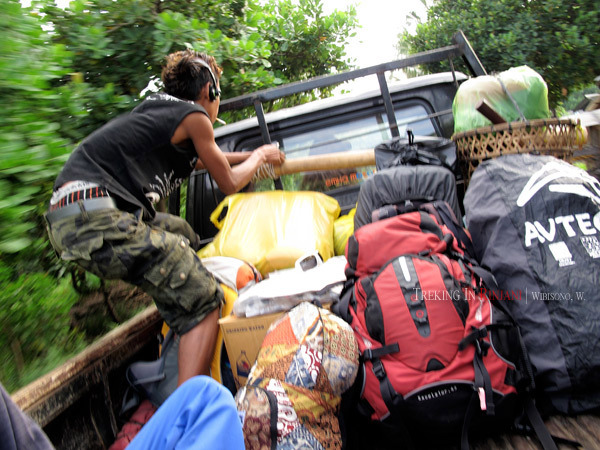 After checking out from Pondok Indah, we jumped to the back of the mini truck that soon headed to Sembalun Lawang. I remembered the last time riding a mini truck two years earlier. It was in Lasem and I was excited watching the daily life along the road while sitting in the back of the truck. As for the foreign tourists, they sat in the front, next to the driver. 'Mister' Adi (that was how he introduced himself), one of the porters, was busy tightening the rope that bound all the heavy stuffs he was going to carry on his shoulders along the trekking. Nearly all the porters and guides were local people. Syaiful, wearing a dark blue shirt, said that to become a trekking guide, someone had to be a porter first for at least three trekkings so as to master the field. As we passed an old mosque, sacred by local people there, Syaiful told us that there was a sect in Lombok known as Islam Watu Telu. Instead of doing the five times prayer, they only do it three times a day. 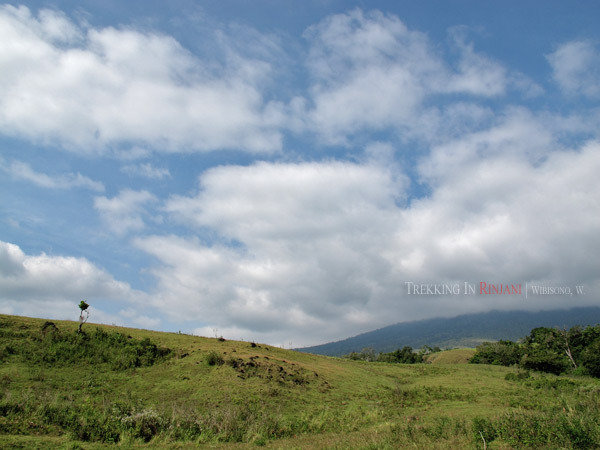 Closer to Sembalun Lawang, we entered a forest where we could hear the birds singing. For someone spending too much time in a heavily polluted city like Jakarta, that moment was really something for me. 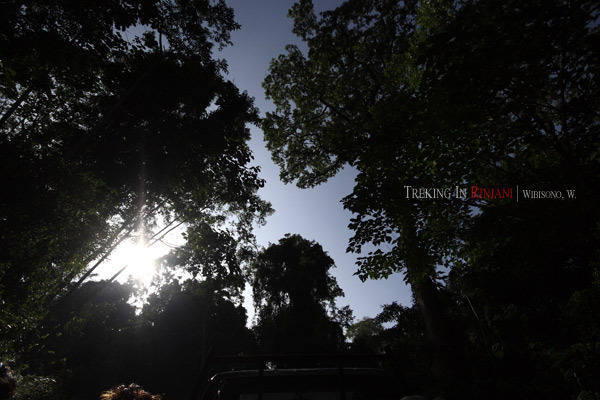 Out of the woods, we passed through a village and stopped at the starting point of the trekking. All the porters got off from the mini truck with all the logistic they were going to carry. The rest of us stayed in the mini truck and headed to Rinjani Information Centre where we had to show our ID card and got registered by writing our names, addresses, and contact numbers in case of emergency. We got an entry card to label our bags. 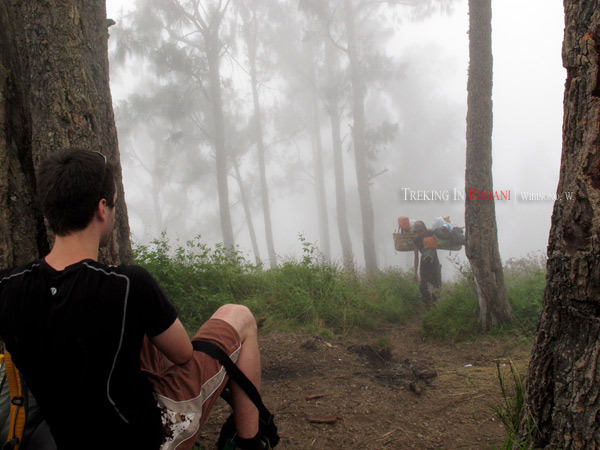 There, Gilang and I got acquainted with the foreign tourist who would trek with us. They were Patrick and Karen, a Canadian couple from Montreal. Going back to the starting point, we got off from the mini truck and ready to trek in the mountain. Syaiful loaded some stuffs like mineral waters and eggs to his huge backpack. 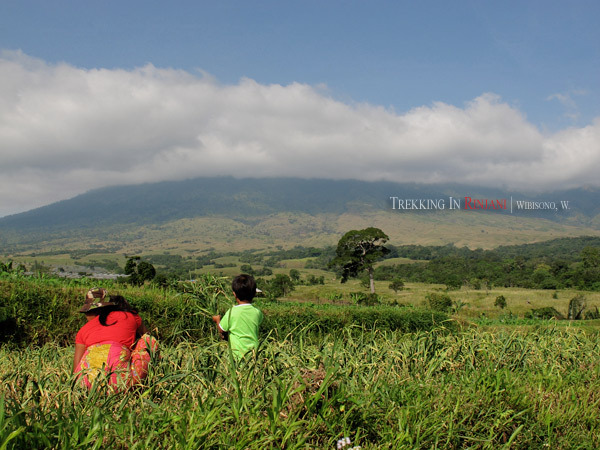 We were about to have an eight hour trekking to our first camping ground at Plawangan Sembalun. 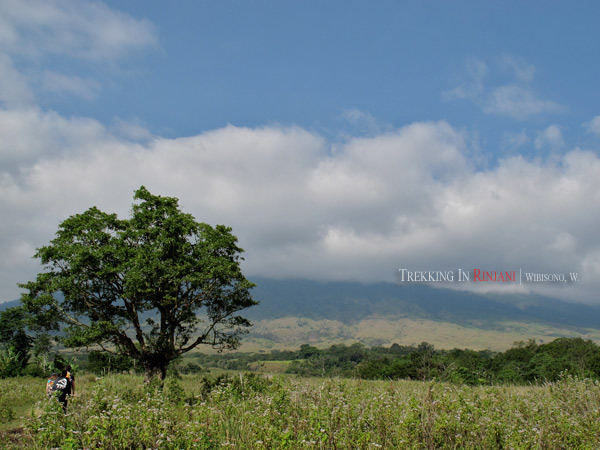 Soon we walked along a narrow path bisecting a small rice field before finally wandering in a real vast savanna. I could smell the grass all over the place. The air was very dry there. With such humidity level, we could easily have our skin burnt. 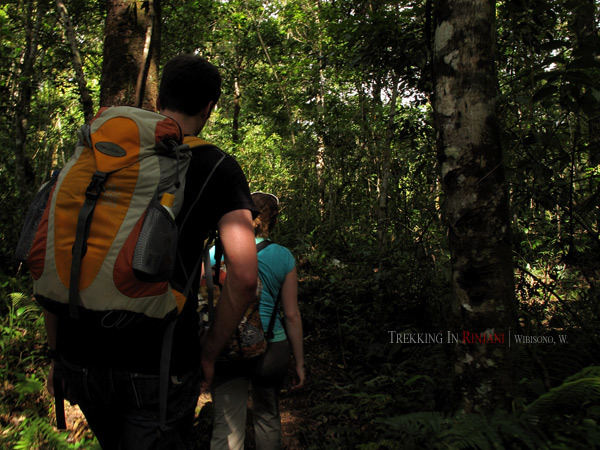 After thirty minutes walking in a plane vast savanna, we had to climb a hill before entering the woods. It was very dark in the woods; even the sun couldn’t penetrate its light. We wandered there for about twenty minutes before finally found a much vaster savanna. So much vaster that I almost felt myself lost. It was nearly twelve when we stopped at Post One for lunch break. The porters cooked for us. We had noodle soup with vegetables and eggs, served with rice. Normally, I never wanted to eat noodle with rice. But in such situation where I might have required lots of carbohydrate to generate calories, it was just fine. 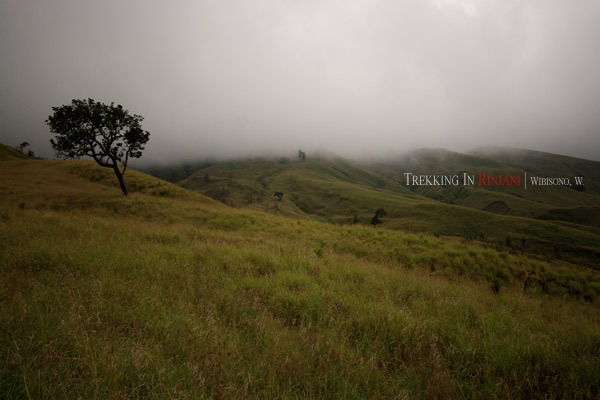 After having lunch and doing midday prayer, we continued the trekking. With the cloudy sky and the mist coming down, we were crossing another savanna. Syaiful said it was a normal thing to happen in the afternoon. The path we walked through was not always plain. Sometimes it was steep and rocky. 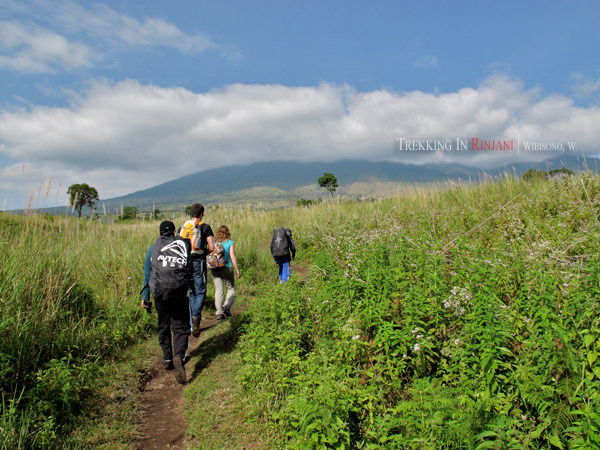 There was no much time to take pictures as the tour guide kept walking so as to reach the camping ground at Plawangan Sembalun on time. 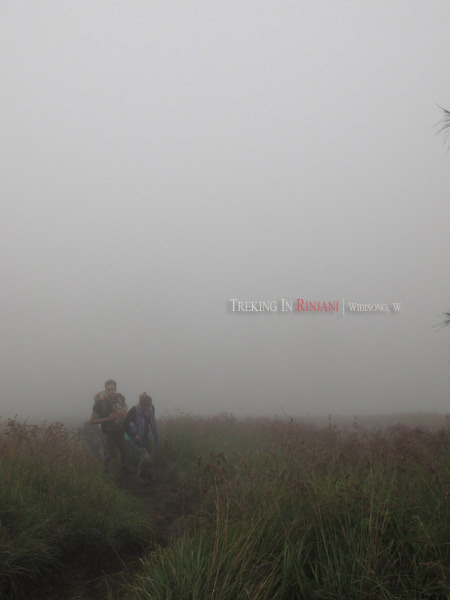 As we climbed higher, the mist got thicker. This caused a problem for Karen who couldn’t stand the cold. Patrick had to check her pulse several times. As for Gilang, he decided to walk last because he couldn’t stop farting and didn’t want anyone to hear it. 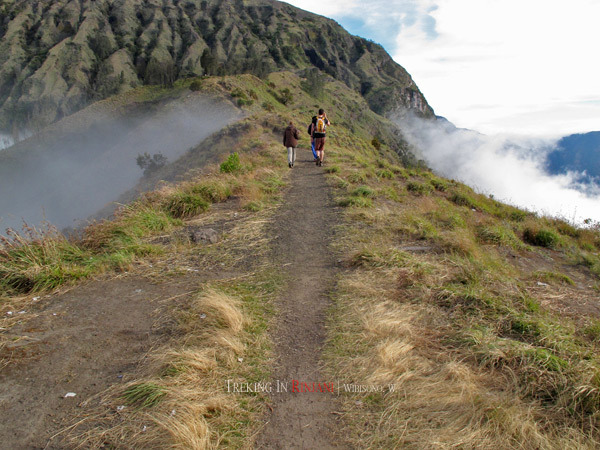 The path got steeper as we got closer to Plawangan Sembalun. 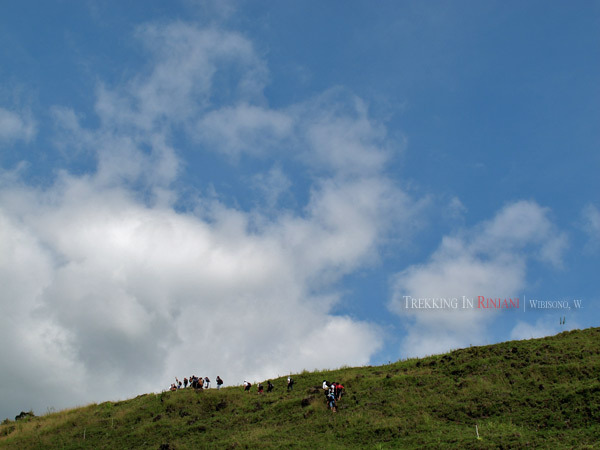 At this point, we passed by a group of trekkers from Malaysia. 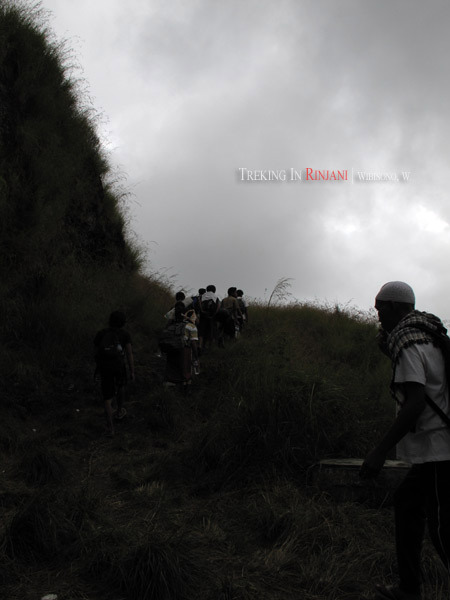 They were climbing down to Desa Sembalun. 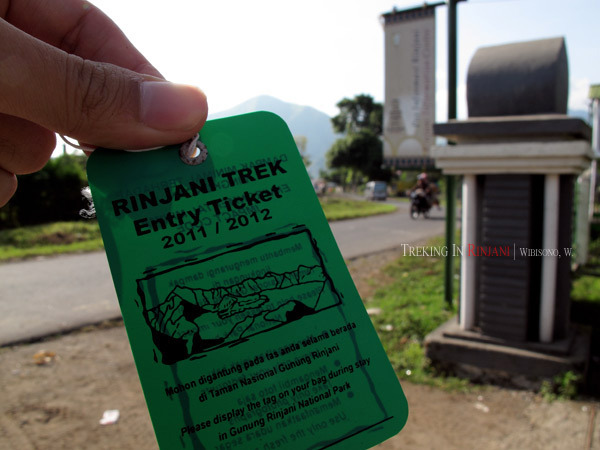 Apparently, they started the trekking from Senaru two days earlier. 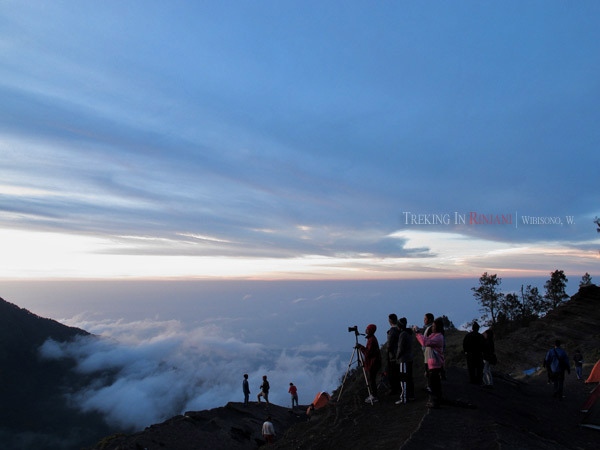 From their guide, we obtained information that the group couldn’t climb the peak in the previous night because the wind had blown very hard there. 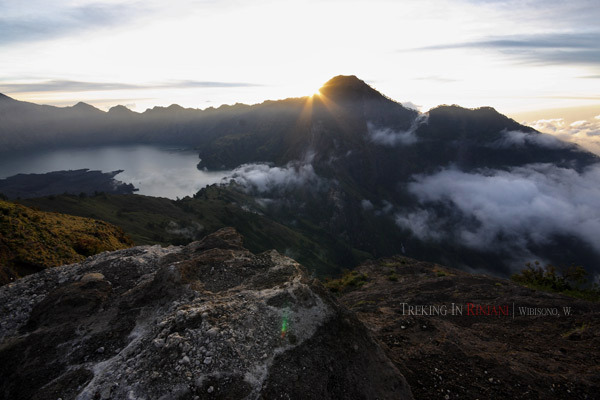 Few days after my returning to Jakarta, I browsed around in Google about myths and legends the locals had in Mount Rinjani. It was said that the porters and guide – who were all local people – usually conducted some kind of ritual before taking the trekkers to the summit at around two at night. 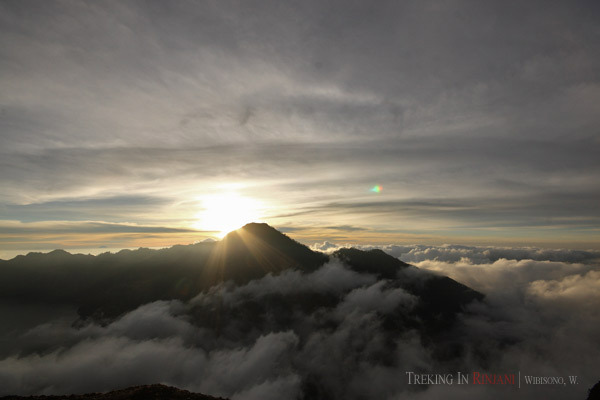 They asked for a permission from a myth figure called Dewi Anjani to climb to the summit. The answer she replied was simply indicated by the wind. Had it blown very hard, that would have meant no. 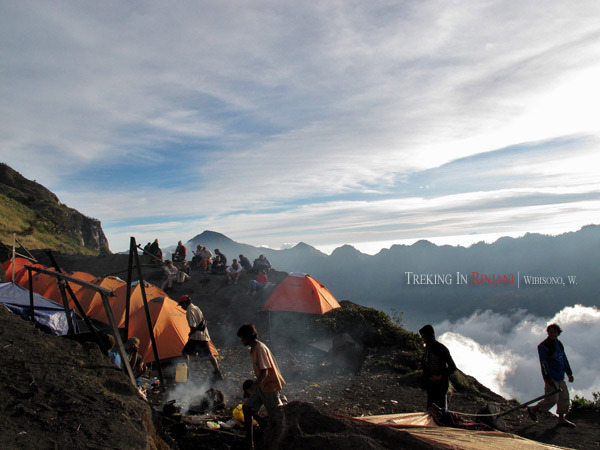 Sometimes the trekkers had to wait until the wind stopped blowing because that would mean the ritual Dewi Anjani had in the summit was over. After a long and exhausting ascent, we finally found a plane ground where we took the last break before reaching the camping ground. For the very first time in my life, I was standing on the ground higher than the clouds. 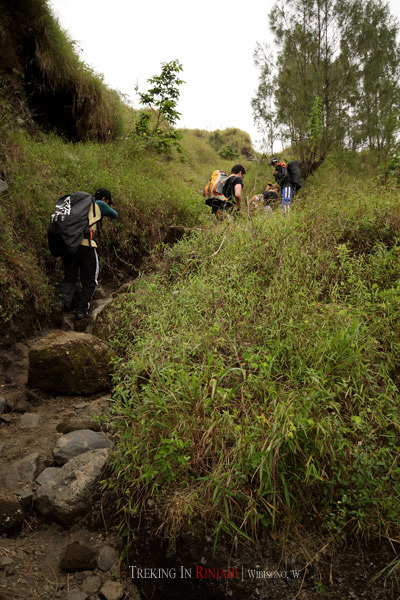 To reach the camping ground, we had to cross a – less than two meters width – path between two ravines in the both sides. 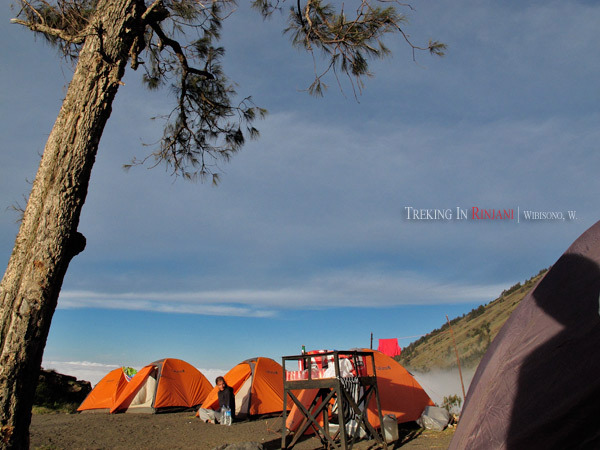 Entering the camping ground, I found that nearly 90% of the trekkers were foreign tourists. Most of them were whites. Well, at least that was what I saw on that day. While waiting for our porter, 'Mister' Adi to set up one toilet tent and two regular ones for us, I rested my legs by sitting on the edge of the cliff, watching the sun set. I was still amazed by the clouds under there. People with camera were excited capturing the sun set. Since I was not so fond of landscape photography, I just took several shots of the mountain. I regret however that I didn't take much of it. It was full moon and then lunar eclipse that night. Standing on the altitude of 2639 meters above the sea level, the moon seemed to be bigger than its regular size. We were lucky to witness that phenomenon from such altitude. After having fried rice with chicken and egg as dinner, Syaiful advised us to sleep and have a good rest as we were going to do the “summit attack” – the activity of climbing to the highest point of the mountain – at two thirty in the following morning. 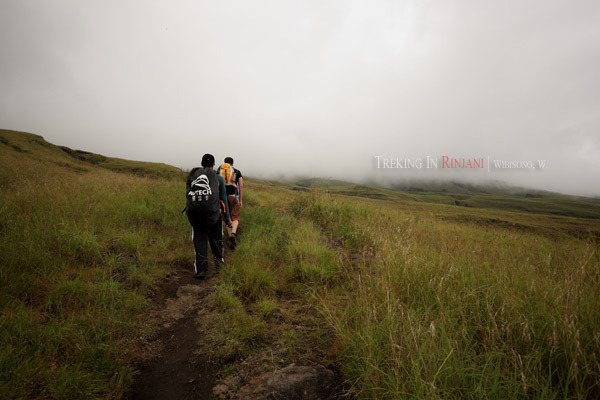 finally the trekking day! how lucky you are experiencing this beautiful journey. slapped by the cloud, that my friends & I always said when we are above the cloud. as usual, your pictures are beautiful. thanks for sharing. I thank you very much for your help and advise for this trekking. I truly appreciate them. Thanks Dod. Gue juga ga bakal ke sini kalo si Gilang ga ngajakin ke sana. Hehehe. Kalo ada lagi, mau ikut ga lo? Last time I know, Norman has no longer taken pictures with DSLR. He sold his camera a few months ago. Abissss.... Hayang balik deui euy. Hehe. 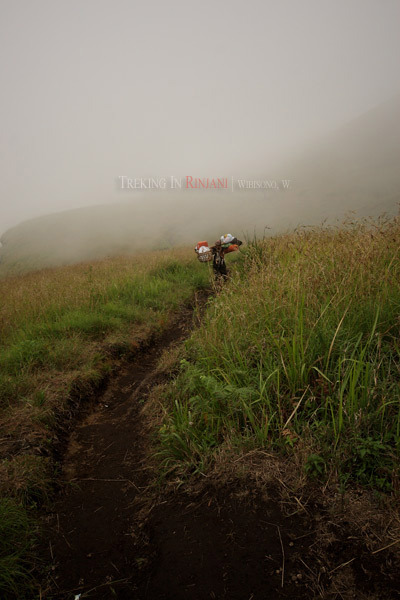 Terima kasih telah menggunakan Rinjani trekking map yang saya buat. Mohon maaf Mas Wayan, sudah pasang petanya tanpa izin.